Macrame is one of those fads that comes in and out of style. Well it's a hot style right now, and applying the craft to garments is all kinds of fun. 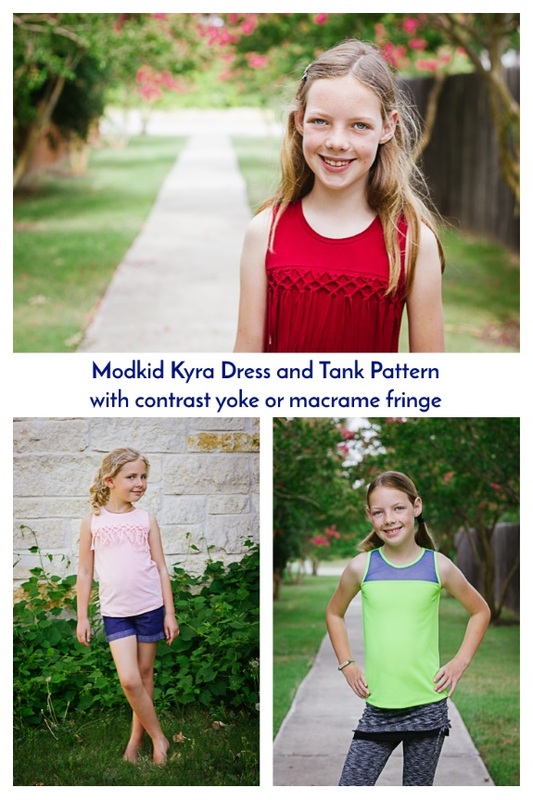 That's why I think you will love the new Modkid Kyra Dress and Tank pattern. The macrame fringe is totally optional though. Opt for the contrast yoke only, and you have a completely different look. The Kyra is also available in teen sizing! This photo shoot with Avery holds the record for the fewest photos needed to get just the right shots. I think it is because she felt so good in this dress that she couldn't help show it off. I went with solid fabrics for all three of my testing garments, but many testers used pretty prints that look equally good. 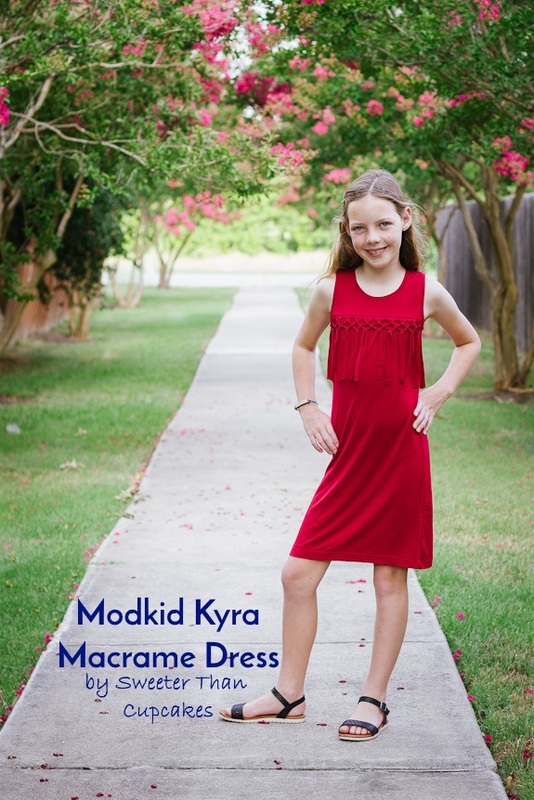 Even the dress length only takes one yard of fabric for the size 8/9, so the Kyra pattern makes for a great scrap buster. This fabric is a rayon spandex from Joann Fabrics. Isn't the macrame detail just fun!?!? Avery likes how is blows in the wind and lifts when she twirls. You know a pattern is versatile when you can completely switch gears from a chic dress to a sporty tank. I've used a blue power mesh for a sheer look on the contrast yoke and neon lime liverpool knit from Finch Fabrics as the main fabric. Avery will be easy to spot on the volleyball court in this combo! If you notice the drag lines around the armscye, we made the adjustments during pre-testing, and as you can see from the dress version, the final is all smoothed out. By the way, the Modkid Steffi Skeggings compliment the sporty style just right. The Kyra tank version with the macrame fringe is a cool summer look. The pretty pink is Art Gallery Solid Knit in Crystal Pink. Note the difference fabric types provide in the fringe style. The pattern instructions have you pull the fringe pieces taut before tying them off. With the cotton spandex here, the fabric curls up. With the rayon spandex in Avery's version the fringe laid straight. Both results add a fun twist. So, which of the four possible combinations of the Kyra Dress and Tank will you make? I vote ALL of them!!! Use coupon code KYRA40 for 40% off until 6/14 at midnight.